such as Frame-by-frame forward/backward using a jog dial, A-B repeat, and Video share. Also it supports many video formats that the standard video player doesn't support. Video share -- You can send the selected video file via Gmail, Bluetooth or the other applications. Support for multi-audio streams and multi-subtitle streams -- You can switch the audio and/or subtitle streams during playback. Required app permission is "Network Communication (Google Play license check)" ONLY -- You can use it at ease. You can start playback by touching the item of the video list. Touch anywhere on the video screen to show the control panel. The default seek time is 15 seconds. You can change the seek time from the settings menu. Touch the jog dial and turn it clockwise for frame-by-frame forward, or turn counterclockwise for frame-by-frame backward. Upon touching the jog dial, playback is paused. Move to the start position using the FF or REW buttons, the seek bar or the jog dial, and then touch the A button. Move to the end position in the same way, and then touch the B button. Touch the Repeat ON/OFF button to toggle repeat mode. 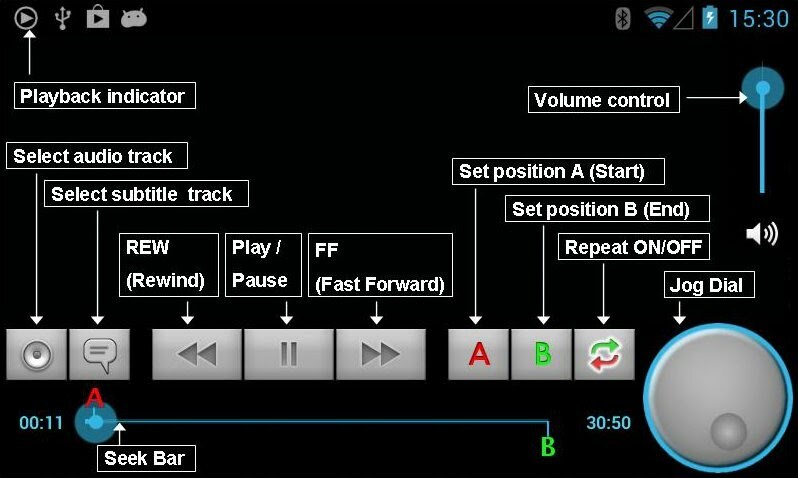 If repeat mode is on, playback between the position "A" and "B" will be repeated. Otherwise, playback between the position "A" and "B" will be executed just once. If the video file contains two or more audio tracks, you can select the audio tracks by touching the Select audio track button. The selection will be kept even after power is off. If the video file contains only one audio track, the button is disabled. by touching the Select subtitle track button. If subtitle(s) are not available, the button is disabled. The subtitle file must have the same file name as the video file with a proper extension, and be placed in the same directory. You can create your own subtitle files with appropriate applications (even with a text editor). Font settings and styles are not supported. Touch & hold a video item in the list you want to share or exclude from the list, until the menu opens. You can send the selected video file via Gmail, Bluetooth or the other applications. Touch "Share" in the menu, and then you can select applications. If you want to exclude the video file from the list, touch "Exclude from list" in the menu. The excluded video file is not deleted. You can recover the excluded file anytime from the settings screen. Touch the Refresh icon to refresh the video list. Usually, the video list is automatically refreshed when the USB storage is updated. However, some systems may not refresh the video list automatically for some reason. So you can refresh the video list manually. If checked, the audio track is continued playing even after the video screen is closed by the other application. This is useful to adjust equalizers from the equalizer application (if any)..
You can return to the video screen by touching "Playing video" on the Notifications panel, or touching "YXS Video Player" icon. If checked, background playback is continued even after screen turns off. You can show the excluded file list and recover the selected files. The sample movie in the screenshots is titled "Big Buck Bunny".